With support from the ‘Wells Remembers’ lottery fund grant we were able to offer 200 year five and six pupils from local schools the opportunity to join in creating a WW1 themed ‘play in a day’. 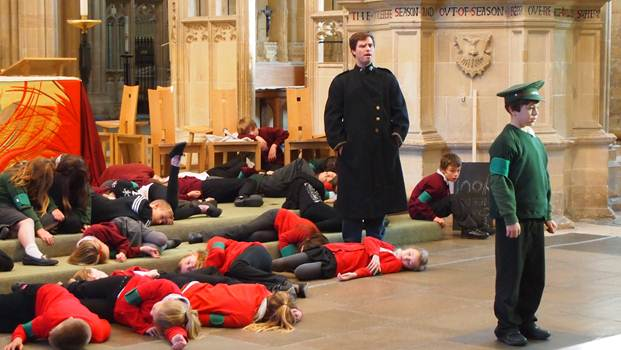 London based theatre company’ Scene change arts’ worked with pupils from Wookey Primary, Hambridge Community School, Huish Primary and Westonzoyland Primary, Preston CofE Primary and Stoberry Park to produce a play about World War one called ‘Over by Christmas’. The pupils became totally immersed and got into Character within the first five minutes of the day. This focus continued throughout the day as pupils gained an appreciation of life during World War One and the experiences of war. 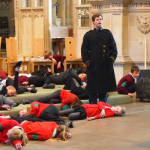 The pupils responded with great intelligence and unity to produce a moving and thought provoking play which they performed in the Nave of the Cathedral for their parents and teachers, at the end of the day.